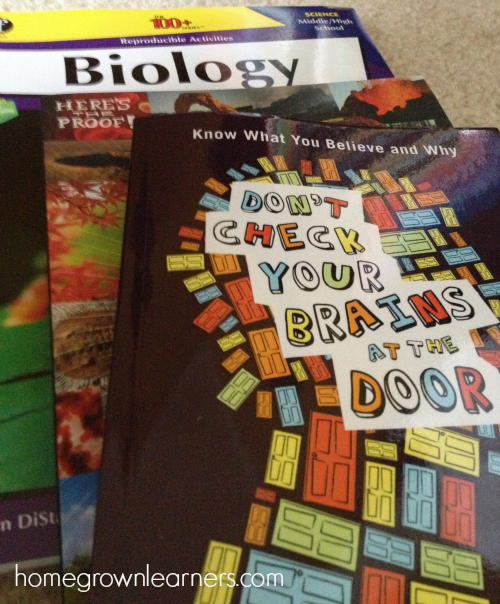 Seventh grade in our homeschool is bringing about major CHANGES. We are joining a Classical Conversations community and my seventh grader will be a part of the Challenge A program. Anna will meet with a small group of her peers and a tutor one day each week for 8 hours. She will take part in dialectic discussions and receive all of her assignments during this time. I'm very excited about this change - but it also brings about some unknowns for all of us. I have heard this is a DIFFICULT year - academically and socially. 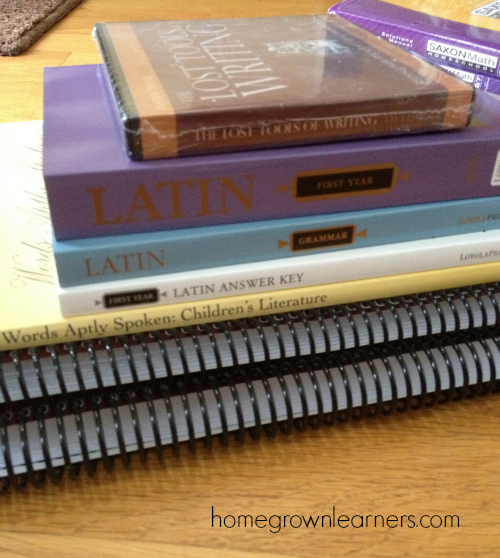 We will be starting Latin, lots of writing, and tons of self management. Our family is prepared to put many things on the back burner to make this year successful. There are some pertinent reasons we chose Classical Conversations at this point in our journey. I'll outline those for you, and then proceed to share the curriculum we will be using. Keep in mind: Most (if not ALL) of this curriculum can be used at home separate from a CC experience. (I think, however, it is optimal to be a part of a group setting at this age.) The curriculum is beautiful and exciting! We believe in the Classical Christian method of home education. We have used bits and pieces over the years, and after reading The CORE by Leigh Bortins and observing a CC Community we are confident this will be a good fit for our family. The mission of CC is to Know God and Make Him Known. This is exactly what we want for our children! It satisfies a need for community and camaraderie - which is especially important as my oldest is approaching the Dialectic Stage of her learning. Accountability! As the material gets more challenging and my daughter is older, we needed an outside person to hold us accountable. Anna's CC Challenge A group will also have a lot of peer accountability. College Preparatory - I want to know that my children will be receiving what is necessary for college entrance, should they choose that path. Less is more. I need to do less planning and worry about our homeschool. I have a hard time narrowing down what I would like the kids to do, and we need focus. After a a full year using Saxon I am sold. We have tried other math programs, and Saxon provides the best mastery of facts, a spiral math approach we like just overall success. Now - ask me if my kids LIKE IT. They will probably tell you they don't. But (and I am so proud of my Anna for saying this) they will tell you that their math skills are more solid and they can see the benefit of Saxon. This year Anna will be working through Saxon 8/7. Consult with Anna's Challenge A tutor about the concept. Use Teaching Tapes or DIVE CDs for help. 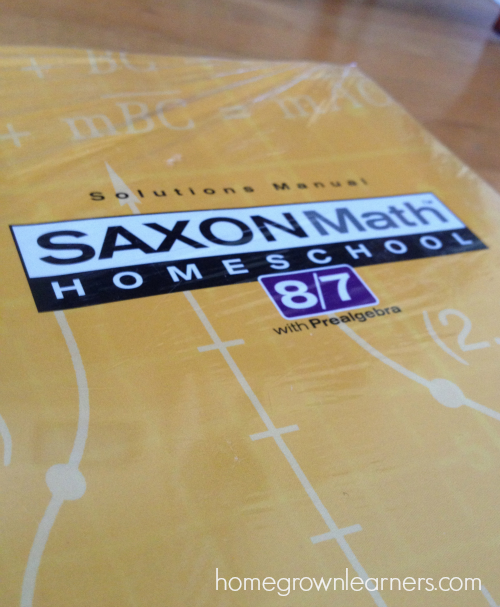 *It is a myth that homeschooling upper grades math is difficult. You just have to know the resources that are available and be willing to invest the time in doing some learning YOURSELF. I'll detail the specifics for you here - but you can also look at the Classical Conversations Challenge A resource list, as well. The companion literature guide for these books is Words Aptly Spoken, which will help me start discussions about the books with Anna. I would love to read these books along with her - thereby sharpening my literary skills this coming year, too. Anna is a graduate of the Writing With Ease. We LOVED this writing program, and I think it has prepared her nicely for the next (and more difficult) phase of her writing. She will be using The Lost Tools of Writing, from the Circe Institute. Looking at the materials is very exciting to me - I know this program is going to push her to become a better writer. This scares me. I will be honest. We haven't studied Latin in much depth, and this year Anna will jump in feet first, using Henle Latin. By the end of the year the Challenge A students are expected to draw the world freehand and labels as many countries as possible. From what I understand, they practice a small section of the world each week and by the end of the year it really isn't a big deal to do this. So - no geography curriculum (per se), and geography is woven into almost everything they are studying. Again - we are new to this, but from what I understand Anna will be learning body systems this year - along with other biology concepts. They perform experiments at her Challenge A class and discuss. We are using the Biology 100+ Series and Lyrical Life Science to guide us. This part of the curriculum excites me! Two books will be used to help Anna learn to defend her faith and understand what she believes and WHY. History is not a formal subject per se in Challenge A. It is woven throughout the other subjects, and the program assumes the student has a firm foundation in history from Foundations and Essentials. I was wondering how this would work since Anna is new to Classical Conversations. Essentially, we have been utilizing a very strong history program (Story of the World) since we began homeschooling, so she should have a grasp of the major events in history. She will also benefit from having a younger sibling in the Foundations program and will be listening in on his memory work each week (which includes timeline sentences). With both children I'll be using Homeschool in the Woods to supplement their history - I'm very excited about this. We will also be cycling back to Medieval History again and will listen to the audio CDs from Story of the World. It's become quite obvious that Anna is a musical young lady. 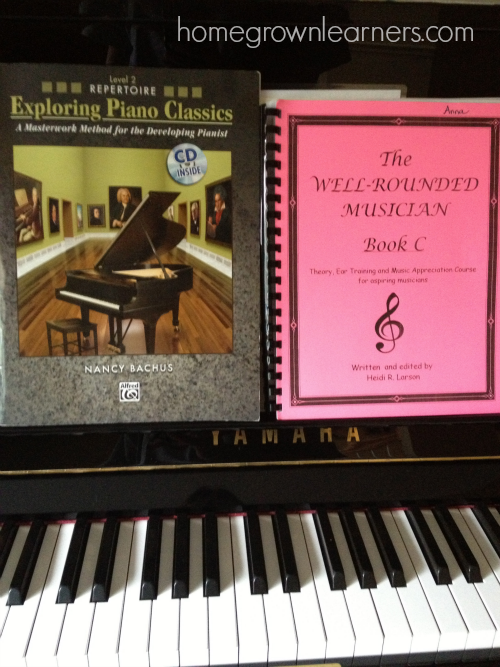 She is in her fifth year of piano lessons and has not intentions of stopping. I love that her teacher incorporates a lot of music theory and also teaches her the history of the music she is studying. Anna will also continue to sing in the Spivey Hall Children's Chorus this year. And, you know we wil always be doing SQUILT for music appreciation! 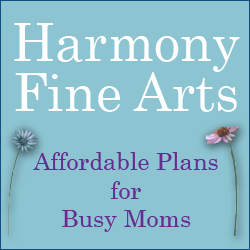 Since my third grader will be using the Harmony Fine Arts plans, I am sure Anna will be listening in and doing picture study and other things as she is able. Also, this past year she loved doing lessons from A Simple Start in Chalk Pastels, so there will be much more of that this year. This is such a great time in a child's life. They are capable of SO much, but are still young in so many ways, too. I look for ways to let her be independent and have lots of opportunities for success and "safe" failures. 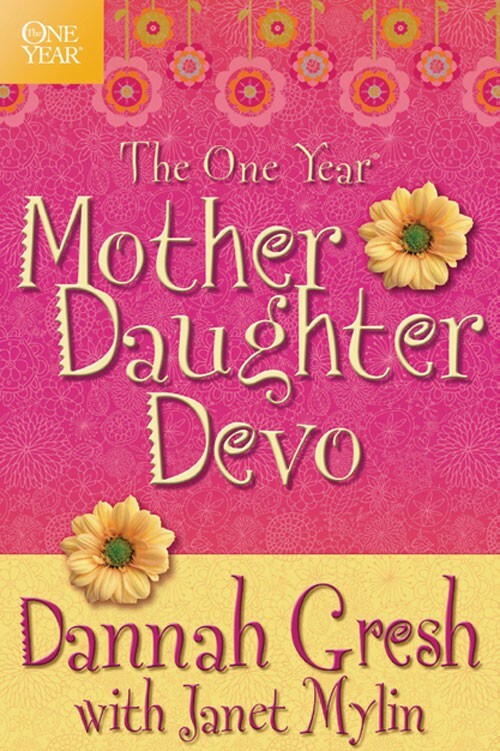 She and I will be using the One Year Mother Daughter Devo by Dana Gresh. I think staying in God's word is crucial during all of our children's years, but especially the middle grades years. Anna is just starting to babysit and will hopefully be doing more of that this year and will be taking a babysitting course this summer. She is also a part of our church middle grades youth program, which in seventh grade marks the beginning of a two year Confirmation program. In short, I'm just anticipating a year full of adjustment, academic rigor, joy, and growth. We won't have an opportunity to drop the ball with anything school related, because of the accountability we are gaining through Classical Conversations. I invite you to follow along as we navigate seventh grade this year! 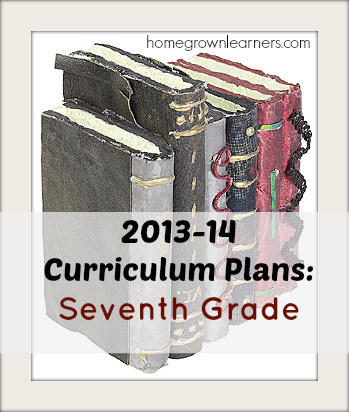 Do you have a middle grades student? Do you have any advice for me? ?